Ethernet, connecting the network cable to DEXGate2 and your local network. GPRS, connecting the 3G antenna into the connector next to the RS232 port. Then, insert the SIM into the slot on the top of the datalogger. Wait about 1 minute and connect your laptop, smartphone or tablet to the WiFi called DEXGATE_XXXX, where XXXX is the identifier of the DEXGate2. An access point is created for configuration. Just enter the password to join the network (default password is the DEXGate2 identifier in capital letters), open your web browser and access http:// 172.16.0.1. In order to acces to the administration page, enter the username and password. By default both are "admin"
The DEXGate2 is capable of connecting to the Internet using a cable or mobile connection. Go to System > Ethernet or 3G depending on the connection and configure the basic information. If you don't know how to configure it contact your systems administrator or your network provider. Go to System > Time and date and select the timezone according to the location. Then just click on Save. DEXGate2 uses the UDP port 123 to syncronize the time. If Syncronization through UDP port 123 is not available, you can set Time and date manually by selecting Manual (Not recommended). Go to Settings > Gateways > and clik on "Register new Gateway"
Select the DEXGate2 and click on "Next"
Fill the form introducing the serial number of the DEXGate2. You can find it under System > Status menu or checking the name of the WiFi you are connected on (DEXGate_XXXXX) where XXXXX in lowercase is the serial number. Every meter works in its own way, so we strongly recommend to read the user manual of the meter. You can configure the bridge through the web administration interface. If you're using modbus devices you need to specify the address and type of each meter. It is important to configure properly the modbus address in order to indicate it on DEXGate system configuration. It takes a few minutes for a message to be processed and visible in www.dexcell.com. Although you can check if the messages have been obtained from the meter and send in the "Log" section of the web administration interface of the DEXGate2. Here you can see the RS485 BUS connector for DEXGate2 in its actual version. Connect your laptop, smartphone or tablet to the WiFi called DEXGATE_XXXX, where XXXX is the identifier of the DEXGate2. An access point is created for configuration. Just enter the password to join the network (the password is the DEXGate2 identifier), open your web browser and access http:// 172.16.0.1. Go to System > 3G/GPRS and configure the mobile network information. If you don't know how to configure it, contact your mobile network provider. You can use a pre-configured operator, or set a custom one. Here you can download the Kernel log and check if everything is correct. Here you can download the System log and check if everything is correct. bridge.parity Options: "even" (default), "odd" or "none". There are 3 profiles: Low, medium and high. They are used to minimize the unnecessary data sent to the server. #parity: "even", "odd" or "none"
This feature lets you see "locally" all the data that will be published in DEXCell, without the need of having the DEXGate2 connected to the internet. If any Modbus device is not compatible yet with DEXGate v2, you can integrate it yourself using the Custom Device feature! In order to do so a JSON device template must be created with the format explained below. Click in "New custom device" button or in "Import device" button if you have a JSON file already created. Introduce a "Device name" (for example, Circutor CVM-mini) and click in "Add Subdevice"
DEXCell service: is the dexcell service identificator. You can find them here. Operation: nothing, multiply, divide or sum. Operand: is the operand of the operation. For example, in the kW to W case, we would set the operand value to 1000 to set the divisor of the operation to 1000. If you want to add additional services for the same subdevice, click on "Add Service"
For additional subdevices under the same "Custom device" click on "Add Subdevice"
When you finish to configure all the devices, click on "Save Device" to apply changes. Read & Write register allows you to obtain the specific value for a Modbus Register or to modify a certain register by using the Modbus Predefined functions. WARNING: Modifying the value of a certain register may change the configuration or normal operation of your devices. Please use the Write option under your responsibility. The technical support team may give you updates to install. You can use this section to do so. To use the DEXGate2 to read IEC meters, you need to connect the USB (MicroUSB) optical probe to the DEXGate2 MicroUSB port. This section provides information of the IEC 870-5-102 processes running in the DEXGate2. 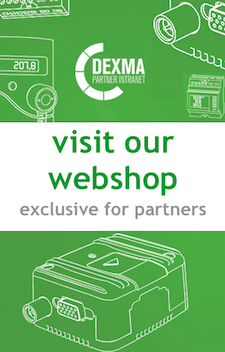 If you want to have access to the DEXGate2 directly from DEXCell Energy Manager, you need to activate the Remote Support under Diagnostic > Remote Support. Then, if you access to DEXCell Energy Manager with a superAdmin or Admin user, and go to Settings > Gateways > edit your gateway > Remote access, you will be able to configure your DEXGate2, directly from DEXCell EM! To reboot your DEXGate2, click on "Reboot". This action will shutdown the gateway, so you will loose your connectivity until DEXGate2 starts again. Modbus Software: The DEXMA modbus software will be change from the factory software. Modbus Configuration: Will have the factory configuration modbus file. You can change the default password using this section. The password by default is "admin". You can change the default password using this section. The password by default is the DEXGate2 identifier.